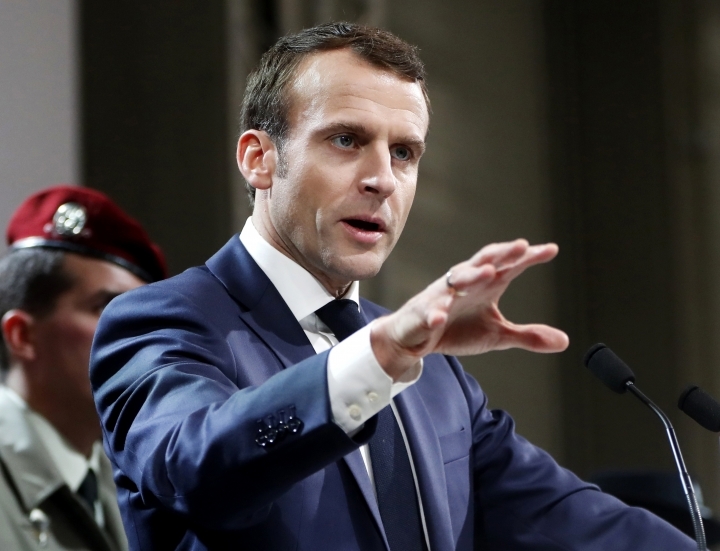 CAIRO — French President Emmanuel Macron aims to speak out stronger than in the past about human rights issues while in Egypt, where France seeks to reinforce strategic ties with a country he considers a key regional partner, he told reporters on Sunday. Heading a large delegation on a three-day trip to the Arab world's most populous country, Macron said he wants to "pursue a truthful dialogue on topics of public freedoms and human rights," an area he feels Egypt has not progressed enough on since he raised it with officials earlier in his mandate. France, which considers itself the birthplace of human rights, has come under pressure by advocates to raise the issue with general-turned-President Abdel-Fattah el-Sissi, whose human rights record has been widely condemned and is seen as worsening. Macron said that too many people who present no threat to the country were being jailed. "It is on this area of what is happening in Egypt that I will continue to focus things. I will do it more openly during this trip," he said, adding that he considered it in the interest of el-Sissi and Egypt to respect human rights. Macron said he felt the current crackdown on opposition in Egypt, begun after el-Sissi overthrew his elected but divisive Islamist predecessor in 2013, had become worse than under the country's longtime autocrat Hosni Mubarak, who was overthrown in the 2011 Arab Spring uprising. "I think what is happening here sooner or later threatens the stability of Egypt. That's to say, I think that the policies as they are being done are perceived by intellectuals, the Egyptian civil society, as being even stronger than (under) the Mubarak regime," he said. Macron said he would raise specific names to el-Sissi in a confidential discussion. Aside from heightened public emphasis on human rights, he did not mention raising any new specific levers to try and incentivize el-Sissi. Rights groups and activists have urged France and other Western powers to halt weapons sales to Egypt, a major purchaser, until it shows improvement on the way it treats its own citizenry. But Macron dismissed using such pressure, saying it was important to respect Egypt's sovereignty and not cut it off because that could drive it further into the arms of the West's authoritarian rivals, Russia and China, which el-Sissi has courted. Asked specifically if human rights issues could affect specific arms sales -- such as one under discussion for additional Rafale advanced fighter jets to Egypt, -- Macron said such matters were separate. Macron arrived earlier in the day in the country's south, where he visited the famed temple of Abu Simbel and other archaeological sites. He meets el-Sissi on Monday, when he will sign several bilateral accords. His delegation includes government ministers, two dozen representatives from academic, cultural, and scientific fields, and a dozen business leaders -- including the heads of Rafale producer Dassault. Macron will dine with local business leaders and meet the heads of Egypt's Christian and Muslim communities during the trip, his first to Egypt since taking office in 2017.